Anime is becoming a regular feature in a cinema-goers life. Thanks to the work of the acclaimed Studio Ghibli, anime is no longer confined to a subculture of fans or film-lovers, instead developing into the mainstream whilst we all sit in glee. The splendid illustrated films from overseas fill our lives with sublime hand-drawn tales that are joyful, poignant, and unique stories. Occasionally, you’ll get a film that will hit your imagination and the deepest parts of your soul. Director Sunao Katabuchi has crafted an enthralling and emotionally harrowing movie piece. The jumbled beginning of the film will unnerve you. It skips through several different time periods without seemingly ageing Suzu, in an off-putting matter. On top of this, there is a balance of the fantastical and the realistic, owing to a lack of cohesive tone within the first half an hour. 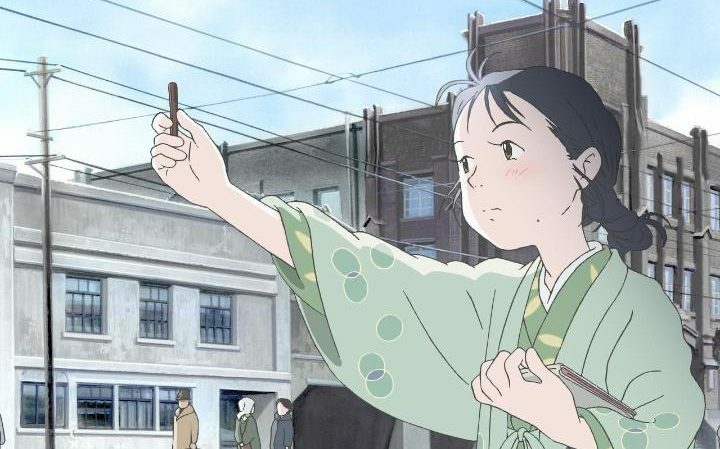 However, after being whipped away from Hiroshima to Kure, the story of Suzu’s life becomes more enchanting and frivolously gleeful. Suzu as a character is so bemusing and realistic. The rambunctious nature of her spirit flows through the whole of the film as she tries desperately to please her new husband and his family. Through the trials of caring for her new husband and the house, Suzu daydreams, creating artistic work on the screen through her unique and colourful viewpoint. The artistry in these visual moments are exquisite portrayals of a vibrant hyperactive mind. They are bombs that burst into brush strokes, paintings that move with her quintessence, and portraits of her loved ones billow greatness on the big screen. The dramatic irony we feel as the audience, knowing the tragedy of Hiroshima in WWII aches as you warm to Suzu. The days drawl with her ever hopeful despite the war intensifying and that looming knowledge will have your heart wrenched and torn. The danger grows and the imminent disaster adds clouds to the proceedings. Yet they are weaved cleverly through the spectrum and through Suzu’s journey. Although, there are scenes that will shock and disturb you, staying alongside you forever. While In This Corner of the World may start with a haphazard beginning, it unfolds in a charming and enriching way. 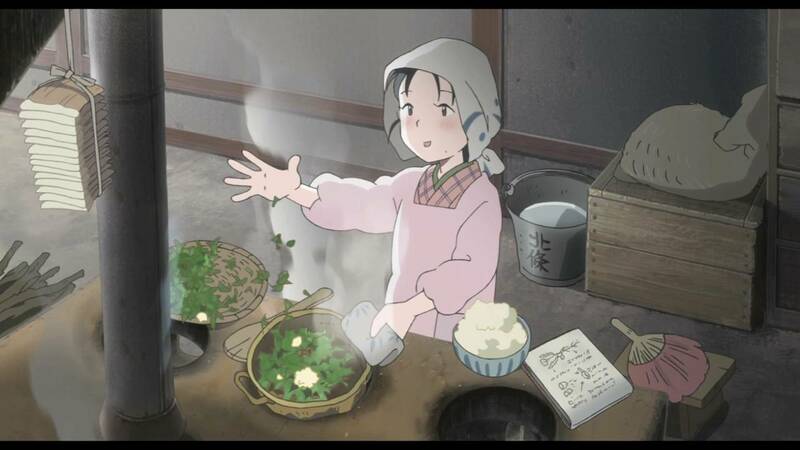 In This Corner of the World is out on DVD & Blu-Ray now!